I had some time this weekend to work on one of my pines. 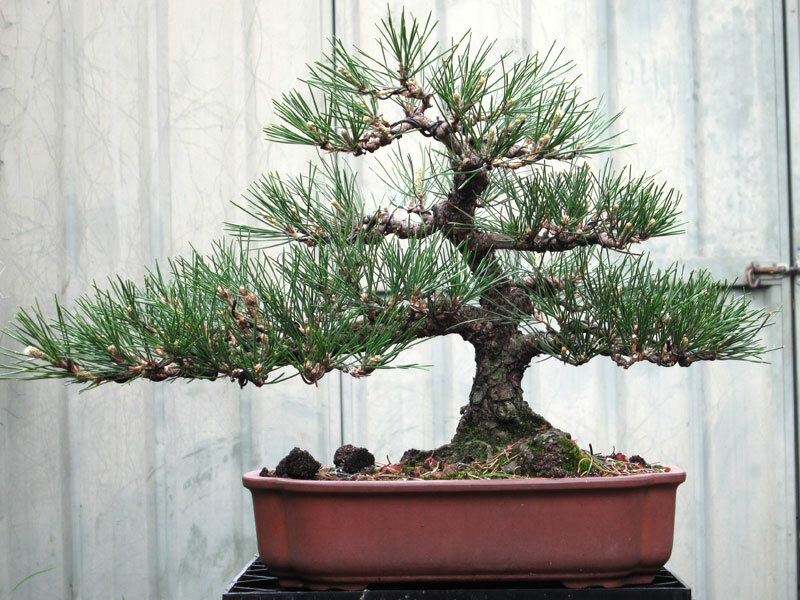 This time i chose to re-wire a small Japanese black pine (Pinus thunbergii). The tree in question had belonged to a member of one of the clubs I belong to. When i received the tree it was estimated to be around 30 years old. It had been a nice little tree, but the last few years before I received the tree it had become leggy and some wire had also been left in the apex which had caused some large swelling and scarring. As a result, I had to prune most of the branches back quite hard and also remove the damaged section of the apex and upper trunk which essentially shortened the tree by a third. The first wiring happened in March 2009. One of the first wirings. Before and after, March 2009. 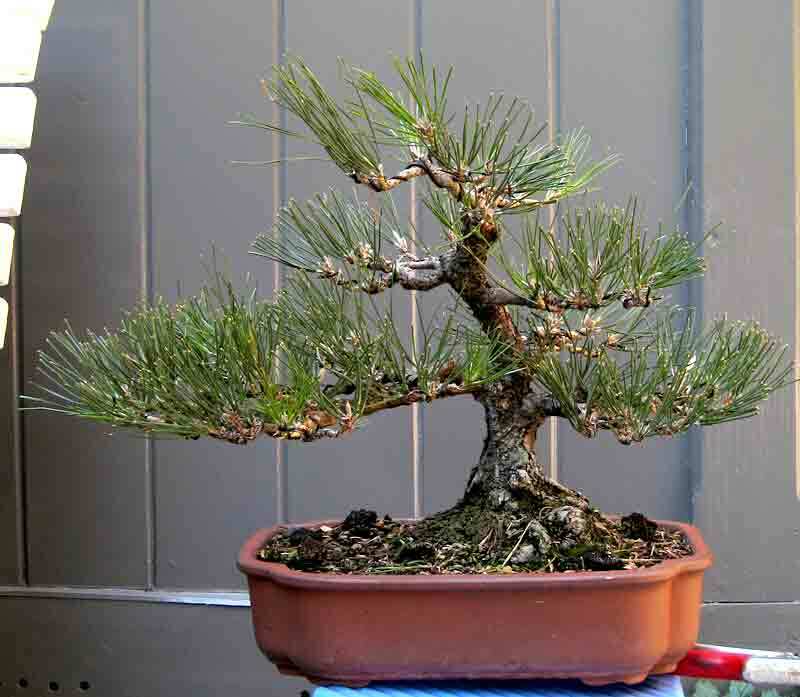 The little pine responded well to heavy feeding and was re-potted into a better mix. It budded back quite well and was ready for another light wiring by April of 2010. After wiring the tips out. April, 2010. As you can see the apex still needs a lot of developement. After cutting the damaged upper trunk off in 2009, I had then had to re-build the apex from a single branch. It is a slow process to rebuild a crown but this little pine responded well and produced a number of buds where i needed them. The tree slowly coming to shape. Pre-wire, first branch and then secondary branches wired. Every year the ramification increases and I am able to remove problem branches and replace them with better growth. The apex has now taken shape and now needs to increase its ramification to fill out its silhouette. Looking at the above picture the shape of the tree becomes clearer, but i think it still has a way to go. I like the long first branch, but am still toying up whether or not to break the foliage mass up into a couple of pads or keep it as a single mass. This years wiring was not the final wiring the tree will see and was done to achieve two things. The first was to start to set the form of the branches a little closer to how I imagine their final positions and also to let more light into the interiors of the structure. By letting more light into the interior I should be able to strengthen weak inner buds and also encourage further back budding. I hope that in a couple more seasons I should be able to even out the foliage density and have the tree ready for show. « A taste of spring.